Apr 04 2003 New from Transducer Techniques an economically priced System combination comprising of our popular TLL (Tension Load Cell) and our PHM-100 Portable Hand-Held Transducer Indicator. This system is suitable for a variety of industrial and OEM force measurement and weighing applications.The PHM-100 has Peak Hold feature that captures at less than one millisecond, and operates on a 9-volt battery for 60 hours. The TLL is a tension in line Load Cell constructed from stainless and is offered in a variety of ranges from 5K LBS. to 50K LBS. Accuracies are consistent with highly accurate strain gage based load cells. 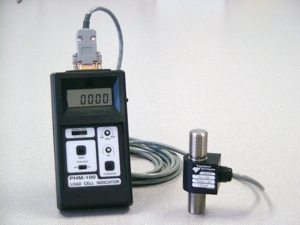 Portable Hand-Held Transducer Indicator (PHM-100) with tension Load Link (TLL) Load Cell.